18.00 - The Vespers and the Liturgy of Saint Basil the Great. 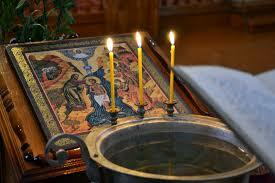 20.00 - The Great Blessing of water (at the end of the Liturgy). Please bring an empty bottle for the Holy water with you. The Service will be conducted in Church-Slavonic, Serbian, Romanian and Icelandic languages. Please, contact séra Timothy for blessing of a house, a car, etc. on this day (tel. 699-12-12). There is no service at St.Nicholas Church at Öldugata 44 in Reykjavik on the 18th of January . For more information, please, contact séra Timothy by mob. tel. 699-1212.